several exciting bits of news to share with you. – after living about six years in europe, i recently relocated back to the state of oregon where i grew up, and planted myself in a small coastal town called pacific city. i felt it time for a break from city life, and i’ve always wanted to try living near the ocean. out here i am slowly but surely working on my next vocal based album for the bella union label, which i believe will drop at some point in the first half of next year. 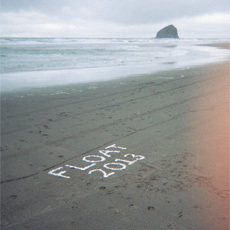 – remember my first full-length album called float? well, my friends at erased tapes are reissuing this baby on vinyl, cd, and limited cassette! the music has been remastered by the amazing nils frahm, and if you ask me it sounds a hell of a lot better. in addition to this new pressing of the album, there will be a 7 inch that goes along with the album which includes one early demo from the writing process of the album, plus one brand new string duet recounting the melodic theme from float, which was written and recorded this year down in los angeles at the amazing fairfax recording studio. say hello to float 2013! – since moving back to oregon i’ve become good friends with a music lover named andrew neerman who runs a sweet little record store called beacon sound. earlier this year, he started a record label with the same name and released a couple great cassettes so far, and now is trying to get funding to start releasing vinyls. the first vinyl release will be a collaboration between myself and gabriel saloman, and andrew has started a kickstarter campaign to support the project. please check it out and get some more info here! – last but not least, my sister heather woods broderick and i will be doing a small strip of concerts together in new york this month. we are both usually so busy touring around that we rarely get to play music together these days . . . so we are really looking forward to share some songs on stage in a few intimate settings. check out the dates to the left! This entry was posted on Saturday, October 5th, 2013 at 8:25 pm	and is filed under News. You can follow any responses to this entry through the RSS 2.0 feed. You can leave a response, or trackback from your own site. are you making plans to have a cat in your new place? or do you already have? Good luck, enjoy your time “Home” It was great to see you several times in The Netherlands during the past few years! Just have stumbled upon «Float» that I have now pre-ordered, while I was doing the same for Nils… I’ve read the description of the album to be released on Erased Tapes on Soundcloud and I must admit I was touched by your words. To read that Float has a new life in part ‘cuz of Nils… I mean… I couldn’t help feeding my curiosity and listen to every single thing of you that I could find in the past two days. Thanks for believing in you… Seriously… The world need this… Can’t wait to receive my copy. I wish you all the success you deserve, Peter. All deserved. Hi Peter – Welcome home! I vote you come back up to Seattle for a show, or Portland.. I miss seeing you live. All possible versions, except uncompressed hi-fi such as FLAC? Why? Please reconsider! Love your stuff, but would love to hear it best way possible. Are you planning a US tour through the West? sandra . . . hopefully next year i’ll tour in the usa! sam . . . sorry about that . . . i’ll have a chat with the label about it.